Fraser Construction Cape Cod LLC is Cape Cod's only 5 star velux skylight Installer. Serving Barnstable, Falmouth, Osterville, Centerville, Sandwich, Mashpee, Cotuit and surrounding cape towns. Take advantage of what natural lighting has to offer! Are you looking for more ways to go green? 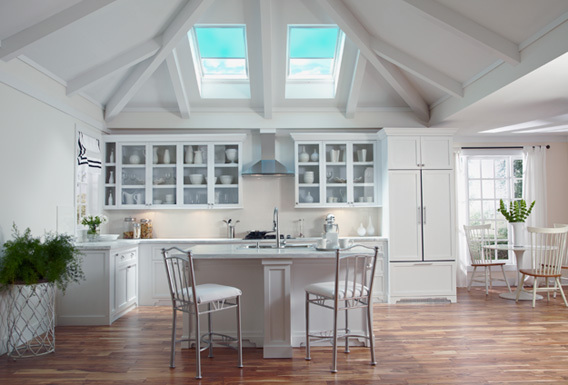 With help from Skylights of Cape Cod a division of Fraser Construction, you can install skylights to use even more natural lighting in your home. Skylights of Cape Cod a division of Fraser Construction Company, Inc.
Skylights to complement your lifestyle! Would you like to close your skylight at at touch of a button? Did you know the price for a Solar Skylight is the same as a manual skylight? As Cape Cod's only 5-star installer of VELUX skylights, you can expect our professional team to properly install your skylights to help significantly reduce energy costs and gain needed daytime lighting. VELUX skylights come in a variety of sizes and available features, so you're guaranteed to find one that matches your needs. Natural Lighting at a price you can afford, Skylights of Cape Cod can work with any budget and with tax incentives we are sure you will be very happy!